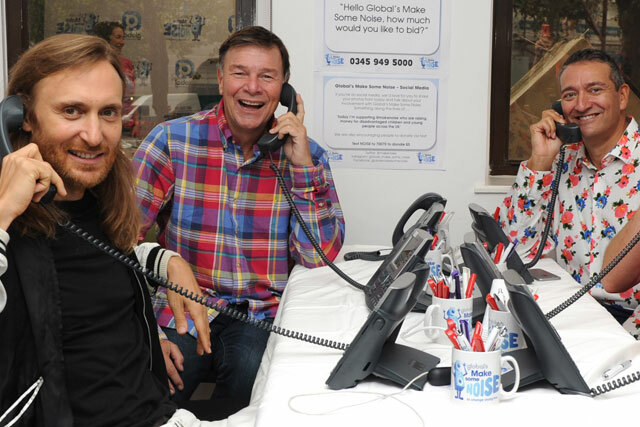 Global made radio history yesterday, when it united its brands across the UK for its new charity Make Some Noise, and raised more than £1 million for disadvantaged children. Global's eight brands - Capital, Capital XTRA, Heart, Classic FM, LBC, XFM, Smooth and Gold - all took part in the fundraising event. Staff at Global's 22 broadcast centres around the country, plus schools, colleges and workplaces participated in a whole host of fundraising activities to help improve young lives. At the event, Lisa Snowdon, from Capital London’s breakfast show, was suspended 244 metres above London as she washed the windows of The Shard, having failed to raise as much money as her co-host Dave Berry. Taylor Swift, who set the challenge, joined Dave and Lisa at The Shard to cheer Lisa on. On Heart, Jenni Falconer was joined by fellow Heart presenters including Emma Bunton, Jamie Theakston, Jason Donovan, Emma Willis and Stephen Mulhern, along with special guest Olly Murs, to cycle the equivalent of Land’s End to John O’Groats (874 miles). They completed their task ahead of schedule, in less than 12 hours. Twenty-two local champions each with a special connection to the projects benefiting from Global’s Make Some Noise, also joined Falconer through the day. Over at Air Studios in North London, the Classic FM team recorded and released a single for Global’s Make Some Noise in just 24 hours. 'Steadfast' features Katherine Jenkins, Laura Wright and Alfie Boe along with Classic FM’s presenters including Myleene Klass, John Suchet and Alexander Armstrong. The track, which will be released later today, will be available to download on iTunes. Nick Clegg, the LBC presenter, deputy prime minister and leader of the Liberal Democrats, was narrowly beaten by Smooth presenter and former British number one tennis player, Andrew Castle, in a tense doubles match. The match, which Castle won by six games to four, was umpired by Speaker of the House of Commons, and huge tennis fan, John Bercow. Luckily he didn’t need to call for order, and the match finished with Clegg reluctantly admitting he had learned a thing or two from Castle. Listeners have rallied to support Global’s Make Some Noise with donations continuing to pour in. Stephen Miron, group chief executive of Global, said: "Global’s Make Some Noise has been a huge success and I would like to thank each and every one of our listeners and staff for their incredible efforts in raising so much money. "Their contribution will make a huge difference to the lives of disadvantaged children and young people across the UK. I’m exceptionally proud of what everyone at Global has managed to achieve in the first fundraising appeal for Global’s Make Some Noise, and have no doubt that Global’s Makes Some Noise in 2015 will be even bigger." One hundred per cent of the money raised will go to Global’s Make Some Noise. The money will support projects that help children and young people affected by illness, disability, bereavement or lack of opportunity, across the country.